The sun set; the dusk fell on the stream, and lights began to appear along the shore. The Chapman lighthouse, a three-legged thing erect on a mud-flat, shone strongly. Lights of ships moved in the fairway -- a great stir of lights going up and going down. And farther west on the upper reaches the place of the monstrous town was still marked ominously on the sky, a brooding gloom in sunshine, a lurid glare under the stars. On one end a large shining map, marked with all the colours of a rainbow. There was a vast amount of red -- good to see at any time, because one knows that some real work is done in there, a deuce of a lot of blue, a little green, smears of orange, and, on the East Coast, a purple patch, to show where the jolly pioneers of progress drink the jolly lager-beer. However, I wasn't going into any of these. I was going into the yellow. Immersive theatre has become big business since the Shunt collective clambered from the recesses of the live art netherworld in the late ’90s, their improbably successful London Bridge club night and string of singular standalone shows whetting the public appetite for the slick blockbuster offerings of Punchdrunk and ‘You Me Bum Bum Train’. 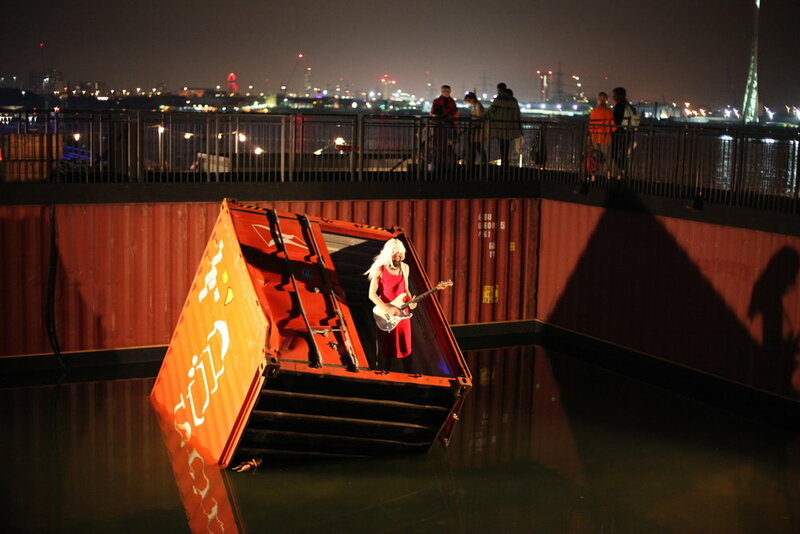 Staged in a complex made of shipping containers on a jetty near The O2, ‘The Boy…’ is essentially a succession of surreal encounters in a succession of different rooms. I doubt it’s a comparison either party would appreciate, but it comes across as a bit like the mad, crack-addled uncle to the wholesome ‘Bum Bum Train’: each room you step into is a fabulously detailed new world, but one in which everything seems to have gone drastically wrong. Most of the performers you encounter wear horrifying latex masks, at least two sections are actively terrifying, and there’s a concerted effort to make things feel as awkward for the audience as possible. I enjoyed ‘The Boy Who Climbed Out of His Face’ for its imagination, its restraint, its striking visuals, its sardonic humour, and because I perhaps fancifully saw it as a brilliant send-up of the more anodyne encounter-based theatre that has sprung up in Shunt’s wake.